The SSL VPN feature (also known as WebVPN) provides support for remote user access to enterprise networks from anywhere on the Internet. Remote access is provided through a Secure Socket Layer- (SSL-) enabled SSL VPN gateway. The SSL VPN gateway allows remote users to establish a secure Virtual Private Network (VPN) tunnel using a web browser. This feature provides a comprehensive solution that allows easy access to a broad range of web resources and web-enabled applications using native HTTP over SSL (HTTPS) browser support. Secure Sockets Layer is a protocol developed by Netscape for transmitting private documents via the Internet. SSL uses a cryptographic system that uses two keys to encrypt data – a public key known to everyone and a private or secret key known only to the recipient of the message. Clientless: Clientless mode provides secure access to private web resources and will provide access to web content. This mode is useful for accessing most content that you would expect to access in a web browser, such as Internet access, databases, and online tools that employ a web interface. Thin Client (port-forwarding Java applet): Thin client mode extends the capability of the cryptographic functions of the web browser to enable remote access to TCP-based applications such as Post Office Protocol version 3 (POP3), Simple Mail Transfer Protocol (SMTP), Internet Message Access protocol (IMAP), Telnet, and Secure Shell (SSH). Tunnel Mode: Full tunnel client mode offers extensive application support through its dynamically downloaded Cisco AnyConnect VPN Client (next-generation SSL VPN Client) for SSL VPN. Full tunnel client mode delivers a lightweight, centrally configured and easy-to-support SSL VPN tunneling client that provides network layer access to virtually any application. In this example, there’s a VPN SSL server with tunnel mode and thin client functionality. The WebVPN service is listening to the address https://[dialer1_ip_address]. The system will ask you some questions; choose what you prefer, but it is important to response “yes” to the last question “Generate Self Signed Router Certificate?”. Note: If you would more info about self-signed certificates read this article. The gateway defines the basic network and cryptographic settings of the SSL VPN server. Create a gateway named ‘ciscozine_gw’, link it to the dialer1 and select the trustpoint to use (in this example, the ‘my-ciscozine-ca’). The ‘inservice’ command is required to enable the webvpn functionality. The context defines portal customization, url list (for the clientless features), port forwarding list (for the thin client), the AAA properties and so on. Define a url-list and a port-forwarding list (to access to the RDP/HTTP server); then link this context to the ‘ciscozine_gw’ gateway and enable the “ciscozine-ctx” context using the “inservice” command. 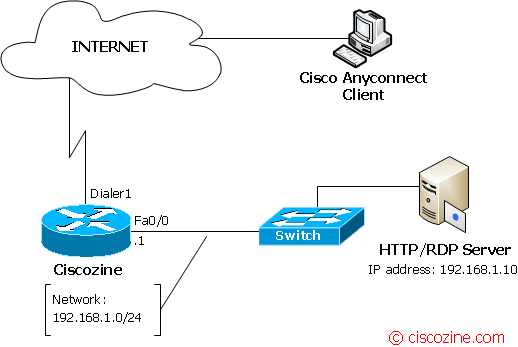 Ciscozine(config-webvpn-port-fwd)#local-port 3390 remote-server "192.168.1.10" remote-port 3389 description "my-rdp"
In the policy groups are applied properties like url-list, port-forwarding list, SVC configuration (for the tunnel mode client) and so on. Apply the url-list and the port-forward list defined in the previous step (3.b Configure the context properties). Configure the SSL VPN Client (SVC) to allow the remote access for the network 192.168.1.0/24. The Cisco Anyconnect is the client used for the tunnel mode feature and it depens by the platforms used. For the Windows, MacOS or Linux operative systems, the client could be saved into the router, so when a client tried to start a full tunnel mode, the Vpn client will be downloaded automatically. To install the SVC for windows platform, download the client from the Cisco site, upload into your router and install in the ‘webvpn’ folder. Remember: To enable a SSL VPN gateway or context process, use the inservice command in webvpn gateway configuration or webvpn context configuration mode. To disable a SSL VPN gateway or context process without removing the configuration from the router configuration file, use the no form of this command. Remember: You can use your smartphone as a VPNSSL Client! For more info check the “Cisco AnyConnect Secure Mobility Client” functionality. The SSL VPN feature (also known as WebVPN) provides support for remote user access to enterprise networks from anywhere on the Internet. Remote access is provided through a Secure Socket Layer- (SSL-) enabled SSL VPN gateway. Join us on LinkedIn! Join us on Facebbook! Follow Us on Twitter! Subscribe to our RSS Feed! Join us on Youtube! Is static port channel a good idea?